15 Responses to Plus ca change? This is a really fascinating article, and it’s helped crystallize a few things that have been bouncing around in the back of my head for a while. Thanks Steve! Hey Steve, great post. The failure to come to grips with exponential growth is definitely at the root of our future suffering. We are all guilty of it, though, not just conservatives. I see this as somewhat inevitable, because there are really no tenable solutions to the problem. It’s like a population of deer in a lush forest. Eventually the population of the deer outgrow the carrying capacity of the forest, a bunch of deer starve, the forest grows back, and the cycle repeats (to oversimplify). Deer have no choice in this, lacking the awareness and tools to recognize and modify their role in the system they find themselves in. In theory, we do have a choice, and that concept is what drives any revolutionary to join the movement – the potential to change the system, the way we as a culture relate to one another (and recently, our environment). But if we are deer in a forest exponentially gobbling up a finite store of resources, what are the alternatives to the harsh population crashes that result from slamming into the wall? Most obviously, we have to limit population growth. Politically, this is a non-starter in any free nation. The only viable option I see here is a long-term plan of education and empowerment of women everywhere in the world, which has been demonstrated to cause birth rates to drop dramatically in areas where women were not previously empowered. But this isn’t really possible without also doing away with draconian political/cultural systems, not to mention abject poverty, a point I think is fairly obvious but would be happy to go into more detail about. I’m not sure how you force a culture that treats women as second-class citizens to change, from outside of that culture, without going to war. Eliminating poverty means growing the economy in a huge percentage of the world, which accelerates resource consumption. Then, we need a new economic system that does not depend on growth to sustain itself. This should be possible in theory, as biology seems to have solved the problem of maintaining a constant size and thriving. The problem is, how do you get there from an economic system whose health is measured in so many different ways by growth? Radical restructuring of the economy is also a political non-starter. The only viable option I see here is to begin colonizing space, increasing the size of the system and the resources to match the population growth. That however is many decades off, before we would begin to see the returns on the huge investments required. All good points. The lecture Vegard sent has a good slide on population. The guy lists a bunch of things we all agree are good things, like medicine and reduced warfare, and a bunch of things that we all agree are bad. Then he says that population growth simply cannot be sustained whether we like it or not, and all the things we think are good make it worse. If it has to crash then it surely crashes through causing the things we think are bad. That’s a pretty bleak outlook, and I don’t have an answer to it. I have read that empowering women in Third World countries is the single biggest influence on population growth, so I’m sure you’re right there and that’s on the good side as well as having the right effect. BTW, I agree that we’re all just as guilty of misunderstanding exponential change. The difference is, liberals don’t look backwards to a supposed golden age (which they too would see, if they chose to look back along the flat part of the curve). To be liberal is to be plural and embrace change; to be conservative is to be singular and resist change – by definition. So we see the same thing in different ways. We’re both just as guilty of not understanding the consequences, though. >But this isn’t really possible without also doing away with draconian political/cultural systems, not to mention abject poverty,[…]. >Then, we need a new economic system that does not depend on growth to sustain itself. this is of course greatly dependent of the population, but assuming that the world population stabilise, there will perhaps be no other choice. first, I’d like to say this is the best and clearest explanation of capitalism I ever read. thanks. secondly, I’d like to point out the the population growth doesn’t follow a exponential curve. it’s more of a sigmoid and the estimations point to a decrease soon (wich have already begun in europe and russia). if you are interested by the question, check http://simplifyurl.com/125z (link to a PDF). the world population should stabilize around 9 billion and then decrease. I also like to point out an important thing that do follow an exponantial growth : education. the rigth is the primary of freedom against egality and the left the primary of egality against freedom. the far rigth system are freedom by inequality (such as the royalty, freedom of the noble by inequality with the paysant, or the nazism, freedom of the german by the inequality against the jew) and the far left is egality by the alienation of freedom (such as the comunism is egality for all by the repression of all (some say by goulag for all)). there is another factor that you need if you want to describe ideologie and it’s authority. for exemple, both facism and comunism are autoritharian and both anarchy and deregulated liberalism are anti autoritharian. what’s interesting is that freedom and egality aren’t (thankfully) always opposed and overlap on numberous issue, so it’s my conviction that resonable people from rigth and left not only can compromise but actualy need each other if they want to optimise the egality and freedom (when you are on a side on the fence you tend to have a bit of a blind spot for the other side. I know I have). Yes, like you say, it’s a sigmoid. Or even a bell curve eventually. I think that’s the point, really. An exponential curve can never continue indefinitely because it approaches an infinite slope. So something has to flatten the curve again and we’re seeing that. But I think the problem with population is that it’s not flattening quickly enough to prevent the downturn from being really steep. When I was born, there were only about 2.5bn people, and that number has tripled in my lifetime. I hope we don’t see an escalation of wars and disease causing that downturn, but I agree that a flattening off is inevitable. You may be right about moderates from both sides needing each other. That uneasy balance seems to have been one way in which our political system has coped with external change. Lots of systems in biology remain fluid by having two opposing forces. But at the same time, it seems to breed increased polarization and spiralling flip-flopping at each election. To Steve, I think the increased polarization was hugely accelerated by the 24-hour news cycle and the internet – specifically the ability for people to choose the news that agrees with your views. That has led to less respect and empathy for people of differing viewpoints, because one’s assumptions are never challenged and it becomes inconceivable that intelligent people could come to different conclusions. That has always been there but the influences I mentioned have made it much, much worse. I don’t really see an end in sight. It is growing exponentially at present. The exponent in the equation may be decreasing, but it’s still exponential while it remains above zero. It’s a bit risky to argue on the basis of a projection. I think for the sake of discussion we are assuming the the growth rate remains above zero well past the point where critical resource contention becomes a global issue. To your point about education, I would consider the year 2050 to be well past that point, but who knows. Maybe it is pessimistic. Ordinarily I consider myself an optimistic person, but the facts of exponential growth are hard to reconcile optimistically. well, actualy it’s not growing exponentially any more, If you look at the data. I like to point it out because ten year ago, it was widely believed that earth population would stabilise around 20 billion people, and now the estimation give us something around 9.
but that doesn’t invalidate your worries, if we stayed blocked at the current 7 billion, the current rate of ressource comsumption would still be a problem. it’s just that the overcrowed earth scenario, with not enough ressource for everyone to eat, isn’t a high probability anymore as it was envisioned ten year ago (if there will be ressource for everyone to have a car or an iphone is a different problem). there two other exponential growth that I’d like to point out, in the hope that they add to the conversation. 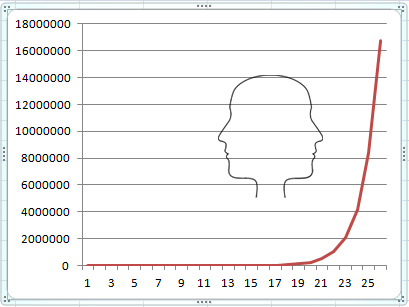 the first one are the exponential growth in science (http://blog.ted.com/2006/11/14/inventor_ray_ku/). I can’t stress enougth how the change are quick and how they potentialy bring earthquake like change to society. if there is any hope on ressources disparition, it will come from here, hopefully in time for a reasonably smooth change. the second one is more based on intuition than backed up by fact, and I gladly have your opinion (and everyone else) on it (and if someone DO have number to confirm or infirm it, please by any mean tell me). it seems to me that production capacity follow an exponential growth. that is to say that the number of man needed to produce, say, 1000 umbrella keep decreasing. or perhaps more acurately, the number of umbrella possibly created by 10 man in a month keep increasing. the chinese worker, by being an unprecedented combinaison of cheap and literate worker (you need to be literate to read manual and work with machine) tend to mask the evolution a bit but there will be a time when machine will be cheaper than even them. the number of jobs isn’t only dependent of demands, and catering for demands and rise of sevices can only take you so far. I think the ratio jobs/people keep decreasing and that will bring greater change to society than anything else. I’d love to believe that population isn’t exponentially growing – that would definitely give me a bit more peace of mind. From a mathematical perspective, if P(n+1) = P(n) * r, where r, the growth rate is > 1, then P follows an exponential curve. You are basically claiming that the global population has already stopped growing, because if a population is growing, it is growing exponentially, and if it is declining, it is declining exponentially as well. You make a good point about education. The youth the world over is getting more and more exposed to the internet which can only make it harder for backwards and/or oppressive cultures to continue holding people down. However in places of poverty this is not happening. And there is a lot of history and inertia in some of these ancient places – or as Steve might say, a lot of negative feedback loops that make it hard for new ways of living to emerge. I would say the pace of technology appears to be exponential, science not so much. The progress of science is definitely non-linear but I think is better characterized as punctuated equilibrium, with lots of little discoveries and the occasional huge one (perhaps obeying a power law of ‘impact’). Production capacity, to the degree it increases, also increases resource consumption, so it’s good in that value creation per capita increases, but at the cost of resource consumption per capita… probably a wash in the end in the context we’re discussing. Whatever curve population growth is currently following, it CAN’T continue to grow exponentially. It’s certain to drop off eventually if it hasn’t already, but that’s never going to be a spontaneous change. Births are innately exponential things. Birth rate only drops off when external factors cause fewer babies to survive. On the good side we do seem to have an epigenetic mechanism that reduces birth rate when it seems that conditions don’t favor having too many infants. But that mechanism didn’t evolve in modern global circumstances, where survival rate can be artificially controlled by medicine and agriculture. On the bad side we have famine, disease and war. They put a ceiling on population growth but not a desirable one. Education, contraception, working women and a cultural shift away from our innate fear of not having someone to look after us when we get old are the best things we can do to limit the curve, and hopefully that can be made to do the trick. But it’s a sobering thought that of all the human beings who have ever existed, more than a third of them are alive right now. As late as a few days ago, I heard about a politician who claimed that we need more growth to solve the problems in Europe. Recently I’ve also started to believe that perhaps a big part of the problem is limited liability in the form of companies; bankers who run successful bank receive huge bonuses which should instead have been saved by the company to get through the bad times. Instead, governments supply bailout packages, perpetuating the bad practice. What if company owners were actually made personally responsible for any and all risks they take? Surely they would then take less risk and save profits. But this is bad for the economy. It doesn’t stimulate growth. Just like high interest rates. True. It would be a hell of a risk, though, if everything you own could be taken away from you just because your company failed. Being a director is already scarier than it seems (but not scary enough to justify 8 million a year). Directors are supposed to be responsible to their shareholders, but in the US people seem to think it’s really a GOOD idea if the CEO takes a huge bonus instead of giving them a dividend, for some reason, so I guess they don’t shout about it during shareholder meetings. I don’t really understand it. Maybe it’s something along the lines of “Hey, I have investments in a company where the CEO hase FIVE private jets. If he’s doing that great, I guess I must be too”? Worryingly, some of the themes of the post are picked up in the game theory research reported in this New Scientist Opinion. It too concludes that violence is a likely consequence of waiting until the last minute before resources run out.